I belong to the south side of India, the southern Asian country, where the rains are not as frequent as the hot sun. But when it rains, it makes sure it does at night. I belong to a developing country, one of the most powerful emerging nations, where there are frequent power cuts due to the energy deficit. And when it goes off, it makes sure it does at night. I have read most of the popular bedtime stories. Panchatantra by Vishnu Sharma, Aesop’s fables, Akbar & Birbal, Tenali Raman and likewise. These are mostly narrated or enacted by the grandparents to their grandchildren which are supposed to be soporific as well as a lesson of morality. The best bedtime story I ever like till today is sleep. Yes, you heard it right. To sleep within minutes after lying. I can assure that this would be the common like. Both the rains with those cacophonous thunders and belligerent lightening and the power cuts with an eerie darkness and annoying silence can separately make us wonder why the hell it has to happen at night. But when these two combine, like they usually do, it turns out to be a night mare, an apt name. Yesterday was one of many such days to come in this monsoon season. The chaos they cause due to their sudden onset is something to reflect till the next day night. It lasts till we get another good night’s sleep. The day was boiling at its peak temperature of 43 degree Celsius and just a few more degrees, it can open up a university to offer them. Those emergency lights, torches, candles, the visiris are at their usual place silently sleeping with deep layers of fine dust particles covering them. They haven’t been touched in a long time. The randomness of the hall was as it always used to be. The presence of two new tube lights, though one always flickered a certain amount of time and needed a tap on its starter to get it started, made us careless. The chairs withdrawn from their place to somewhere near the television, the sofas moved due to the weight and the force of the person ensconced in them, those small coffee tables adjusted to suit our legs stretched from the comfort of the chairs or the sofas. It was completely random with a zero probability of locating their position. It was around eleven when we all arrived at a decision to turn the lights off or rather our parents forced us to turn them off. I wasn't even past the first stage of sleep when the thuds made me groan in anger. I thought I was hearing it in some dream because it was not possible for a rain after a 43⁰C day. The hollering of the rain mocked me and yet I was not ready to give up. Definitely not in an 18⁰C air-conditioned atmosphere in the bedroom. The cacophony increased giving me a call to enjoy the rain. Damn it, the hands were about to strike midnight. I should have woken up in that artificial pleasant temperature but my sub-conscious mind found it too pleasing to wake. Only later to find out sweat beads sliding down my face to my neck and it gathered around my neck causing discomfort. The electricity has failed. Thomas Alva Edison or Nicolas Tesla, whoever you are forming sides with, had failed. Contraptions! I have been a fan of them in Tom and Jerry, a global one and Aboorva Sagotharargal, a local one. “Uch!” The very famous regional expression of irritation sounded from all the four of us in unison. “Appa, check the fuses.” The box is located outside the front door in the parking space. The burning of fuses or the trippers tripping is not a strange phenomenon taking the overloading into consideration. My dad took his time to open his eyes from that deep sleep. He has this gift of my best bedtime story. Sleep within minutes. We are no pirates or pilots to adjust to the darkness immediately and it took time for him to locate the door. He worked his way to the lock and forced it open. “Aaah! Who the hell put this table here on the way?” I figured it out from that first noise and it was me who did it to see a match yesterday night. I feigned sleeping inside the blanket ignoring the increasing temperature. He reached the front door. The door opened with a screeching sound and he hollered for a light. My mom knew that I was awake and patted me to help my dad out. Cursing the rains and power cuts, I stood up to find the total place engulfed in darkness. “This is going to be an adventure.” I thought. Same “dum!” but a different “Aah!” with an “a” less this time. This time it was a chair and I couldn’t curse no one except of course the rains and the power cuts for it was me again who put it there. I found the light and was surprised to see how quickly the forty plus changed to fifteen plus degrees. The street lights are getting their power from a different transformer and the neighbouring homes had batteries. There was no fuse burns and it was blatantly the power cut. “Ma, call the electricity board!” It was my sister this time. My mom told we could wait for a few more minutes, may be fifteen. I waddled off to the kitchen to get some water and again “dum” and “aaah” repeated. It was the fridge in the other side of the house and from then on I spread my hands in an eagle-like position against the walls to move slowly. We became desperate and the room was getting warmer. The emergency lights invited some insects and a couple of more degrees and I was like, “Sorry, no hospitality!” and turned it off. The Visiri search proved to be another adventure and this time it was my mom with same “dum!” and “Aah!” and a little curse. I wasn’t sure what it was that time. The call to the electricity board always goes in one of the following three ways. “The number you are trying to reach is speaking to someone else. Please try again later.” an amiable voice. “There are people rectifying the fault now. It may come in an hour.” An abrupt response. “Which area are you from again?” feigning an innocence. I read the power cuts can be efficiently used as a family time and opened my mouth. My voice echoed and sounded like some devilish snarl and I was rightly given an award claiming me an “Amplifier” in my college farewell. I shut it tight and curses continued. After a long time, which seemed to be eternity, a small flick in the lights of the fuse, the power was back. I was about to give a long sigh when I noticed it. “Low Voltage”. “Varum thambi, aana Varathu” range. It was looking akin a cadaverous old man tottering. 220 V is the voltage range in India and it’s normal to be around 180+. And it’s now 120+. If India is competing with United States in any sector, it is in the Potential difference, the voltage, though they are technically a little different. And the low voltage has never gone away without again shutting down the power and turning it on. This was a 10 minutes to 30 minutes, at times an hour long process. And the AC would turn on, and the gush would make it feel like heaven and “Pat!” it went off. This continued on and on and on and on. When the power went off again, it was difficult not to be terrified whether it was for setting the right voltage or for the entire process to repeat. When everything got back normal, my parents told it was time for my sister to wake up for her college. I laughed slyly at her that I could get to sleep till I desire. When I woke up today, she already reached her college and there was no current again. The destiny has laughed slyly at me. He is an adamant, egotistic, self-centered Jackass. I saw him walking past my room, in his usual three piece suit, heading towards his office. His assistant followed him with eyes showing fear. He is feared by all who have known him,all who have heard about him and all who have talked with him. All except one, and that's me. I am not an intrepid hero living among the cowards. I am his partner and also used to be his friend, when you all didn't know him. "He is an adamant, egotistic, self-centered Jackass." I heard one of the people nearby whispering to his friend. "That guy in that 3-million dollar suit has no life. He is always about getting things done." "He should have never known the word 'enjoy'. I've never seen him smile. I've never seen anything else except his stern look." I laughed. I looked at that Jackass who was throwing orders around. "How can a guy be so asocial? In fact anti-social? The word is that he had never had a casual talk in his life." That's enough. I walked towards the door and shut it close. I know much more than what you all know. I sat down on a sofa asking my assistant not to send anyone in. It has been 2 years since he stopped talking to me. 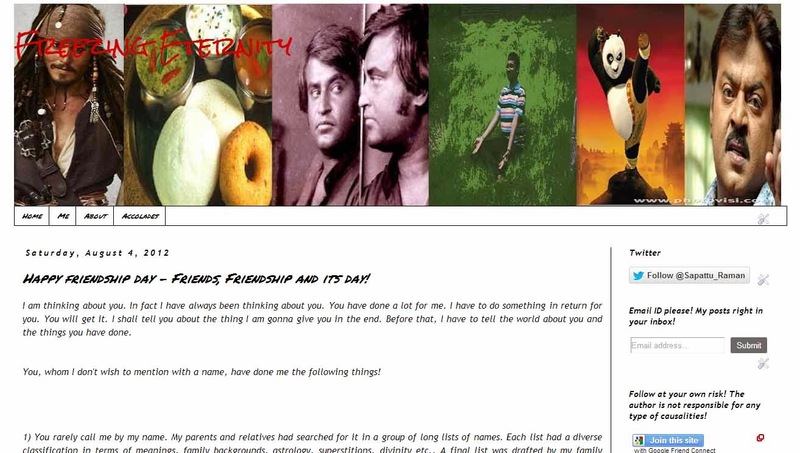 On this day two years back, his birthday, I arranged a surprise party for him and I had thrown myself out of his life. Not two years back, he has been this way since his college days. Back then, he was that innocent kid who loves to pull others' leg. He loved those evenings with friends, TV shows marathon, those chat shops for a snack, parties for friends' birthdays, games at places and he did what all normal kids would do. He enjoyed his life. I have always wondered whether it was, whatever had happened, worthy for this change. It doesn't matter what I thought. He thought it mattered and here is he, changed. As all the other similar stories, it was a girl. But these were not lovers. Definitely not the type who would hang out together always, sit and talk for hours, give loads of presents, roam to different places, talked 24X7 or told their every single move . They had not even traveled in the same bus many times, they did not even hold their hands, they never sat together alone for more than minutes. But he liked her and thought that she was going to be his best friend and he was somehow special to her. His life at home was not so caring as the care was always towards the other guy in his home. He was supposed to be the child who should always understand the situation. He did and her care showed him a new walk of life. He didn't know that she was caring by nature and thought that he was unique to her. They became close to share things but always with a limit. He knew that he should never cross that limit. We all have close friends. Different close friends. Different times. Different people close to us during different times. Like these parties which form alliance with various parties through out their existence, one party during one election and next during the other. We are not to be blamed. We are programmed to function that way by the nature. And there are a few parties which never understand this trick. A devilish trick. They try to stand just and lose elections. Lose their party altogether. Everyone forgets the party totally. He was one such party. She had three or four close ones at that time. It was not her fault. She was being normal and he was, indeed, abnormal. Who, on this earth, remain close to one and only that one through out? Even the marriages, which are supposed to be decided in heavens, fall apart. How would this friendship last? His other friends, who are not emotionally attached, remained emotionally unattached. I tried to speak sense to him. He would just not listen. The season changed, so did the election, so did her closeness. Time to move. She moved on. Leaving him stranded in a swamp! A marsh! A deadly marsh. He was left alone. Her leaving him was not the fault. He, being left alone, was the fault. The world, the bloody world, thought he was in love. He wasn't. All he had was a friendship. A caring friendship. One would question me, Why didn't I be his caring friend. I had my own alliance. Sorry, but I tried to talk to him. But he spoke to none. Not a word. Apart from her, me and a few others, he closed his world. He also exists in her world. As a contact in her cellphone, with a name appended with some form of remembering key. As a Facebook friend whom she would never notice in a crowd of 1000 friends. Whom she would wish, posting a "Happy Birthday" note on his wall. He would remain a guy to whom she would send her Marriage invitation. What am I doing here? Well, maybe next time! Email ID please! My posts right in your inbox! Follow at your own risk! The author is not responsible for any type of causalities! Hey, Today is declared a holiday! Happy friendship day - Friends, Friendship and its day! The star of the twelve! The contents posted on this blog, with the exception of pictures and as and otherwise indicated, are the intellectual property of their author Harikrishna Raghuraman. The copyrights of these lie solely with the author and therefore unauthorized use of these contents is prohibited. If you wish to use any property of this blog, you may well contact the author at his email. Read the terms of copyright here.